With the Supreme Court now occupied by a conservative majority, the prospect of President Trump appointing yet another right-leaning justice to the bench has liberals absolutely terrified. And unfortunately, it now looks like the health one of the Court’s few remaining liberals might be in serious jeopardy: According to reports, Ruth Bader Ginsburg’s aides are desperately trying to talk her out of teaching herself to do a front flip. Wow. Justice Ginsburg’s timing could not be worse here. Earlier this week, sources inside the nation’s highest court reported that aides close to Ginsburg were working around the clock to dissuade the 85-year-old justice from learning how to do a front flip, which she’s been preparing for by watching parkour videos on YouTube and laying a single couch cushion on her office floor as a means of breaking her fall. So far, Justice Ginsburg has only ignored her assistants’ pleas, paying no mind to the fact that performing a standing front tuck would be difficult for even a fit young person, let alone an octogenarian in physical decline. Though assistants have warned her about the various grave injuries she could potentially suffer, sources say that Justice Ginsburg feels a duty to attempt the flip so that she can prove to young girls that women are capable of doing anything they set their minds to. To her staff’s dismay, Ginsburg has also dismissed suggestions that she try a safer maneuver more suited for someone of her age and physicality, such as a slow somersault with several aides carefully guiding her, or even just gently spinning all the way around in a computer chair so that she can still experience a 360-degree rotation but without having to hurl herself head over heels. 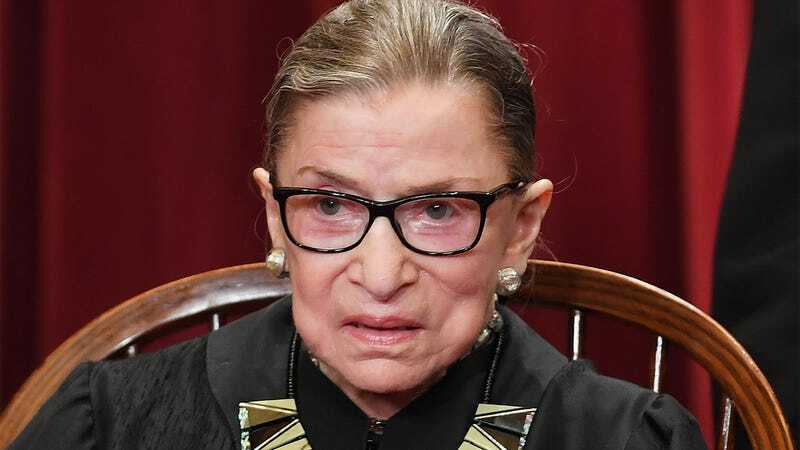 Sources say that not only is Ginsburg insistent on trying to do a front flip, but she’d also like to do one as soon as possible and is actually readying herself for an attempt later today. According to reports, Ginsburg is currently suiting up in a wrestling singlet and cleats and is listening to “Rock And Roll Part 2” by Gary Glitter to hype her up for the feat, sending her clerks into full-on panic mode. While her staff is frantically urging her to consider the hard-won progressive legislation that would be at stake if she were to botch the flip and incur an injury that forces her to retire, Ginsburg reportedly will not be dissuaded and is now applying Icy Hot to her knees and lower back to ready her joints and muscles for the impending attempt. Yikes. It looks like the same steadfast tenacity that made Ginsburg’s legal legacy so impactful may also be its own undoing. Liberals had better pray that Ginsburg’s aides get through to her, because years of social progress could be lost if Trump gets the chance to appoint another conservative justice to the Supreme Court. Please be careful, RBG! America needs you!